is to have em and not use em… Guess I have been a bad boy……..
Inappropriate use of a UHF log-periodic antenna. 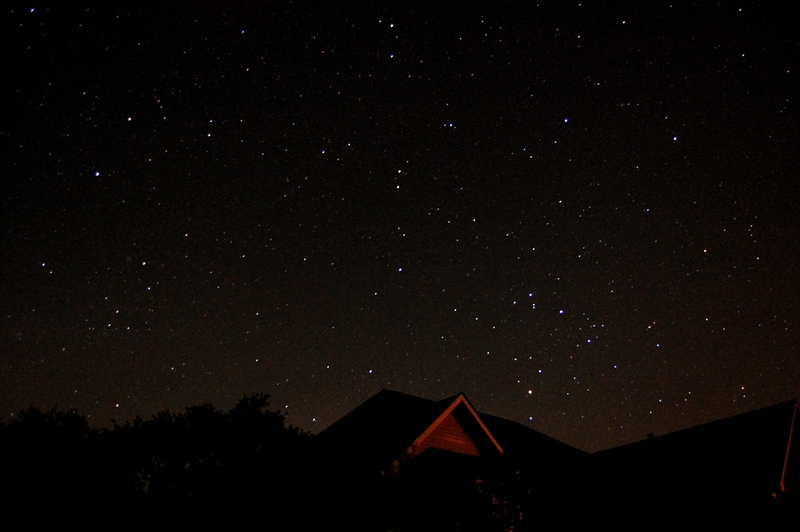 One of the more enjoyable features of our extended power outage after the tornado events in April, stars… Stars like you never saw anywhere. You can click these images for a larger one. Typically this view is mostly illuminated haze from all the lights to the east towards Huntsville. This is a time-exposure, with the shutter held open for about 30 seconds. Shoot, in the summer – we often don’t even get a dozen stars bright enough to make it thru the humidity and the haze of humanity. This was a treat. I usually have to go to North Carolina, up on the Blue Ridge Parkway to see this many stars, especially with such clarity. For a day or so after the tornadoes, the humidity was very low – and with no power to flood the sky with lights – we had a magnificent view of the heavens. The airport has generator power and was open. 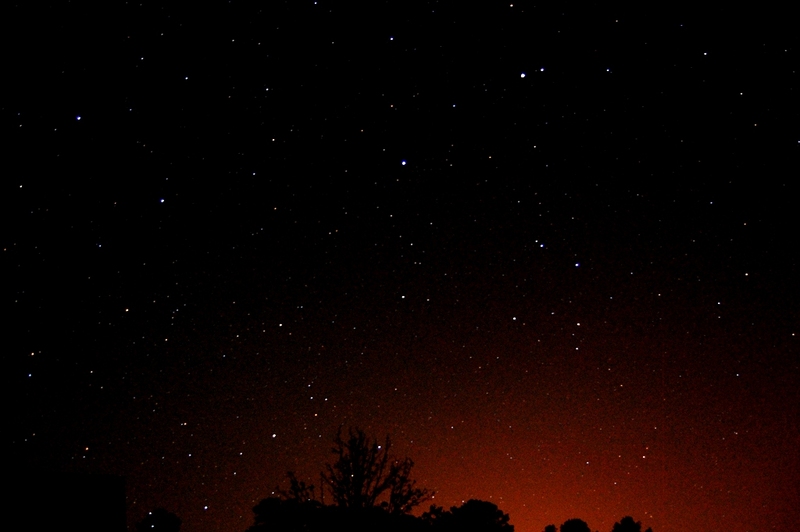 This glow was from those lights about five miles away. After a few days tho, the neighbors were also running generators and aside from the lights, the noise was enough to keep me inside when I was home at night. I’m glad I caught these pics when I did, as it wasn’t long before the humidity shot back up, and the lights and noise took over again. Sure was nice while it lasted. I tried to get some pictures that didn’t reflect only the damage and destruction. I’ll try to get those posted here as well; as even in the chaos, there is always beauty in nature – if you seek it out and preserve it. Photos are great for that. These are two such photos, barely 48 hr after such a disaster .. Thanks to everyone who has offered support and solstice in my wrestle with the flooding emotions that seemed to haunt me in the weeks after these storms. Also thanks to everyone who has helped and continues to support the on-going recovery effort for our neighbors here and across the US. I was really surprised that this has affected me so deeply. I do understand that talking & writing like this is helpful in my recovery, and I am mostly beyond the challenging parts. I let myself get very close to this. That is not always a good thing. I will never be the same, as I still feel that some of the most significant work I have ever done, was in this response. Anything else I do here on out is just the icing on that cake. Hope I never need to, but I’d gladly do it all over again. But – it is not about me. Continue to do the good work, and go the extra miles for your friends and neighbors. Your reward is in the pride and joy of helping…. Trust me – it is well worth the effort. Try it – you will like it ..!.. So hard to believe that it has been three weeks already. Nearly a month. Sometimes it seems so long ago, other times – like it just happened.. Took a drive last Saturday thru our ‘Tornado Zone’, to show Lenore and Shelby how bad it really was – and to get a few more photos. There was a hope that they might better understand how and why this has affected me so deeply. We’ll see. This map from the NWS storm survey, showing purple dots where I have taken photos – some were linked in previous blog posts. The smaller inset locates this map in a larger view of the tornado scar across Limestone and Madison Counties. This batch of photos starts in the south-west corner of the map, near the Limestone County Prison where many of the TVA transmission towers were destroyed. You can see that this re-construction is well under way. The fields are so broad and open – the tornado was about a half mile wide here. There is a large field just north of there that is receiving a steady stream of dump trucks bringing tree debris and the remains of houses, several acres have already piled up. 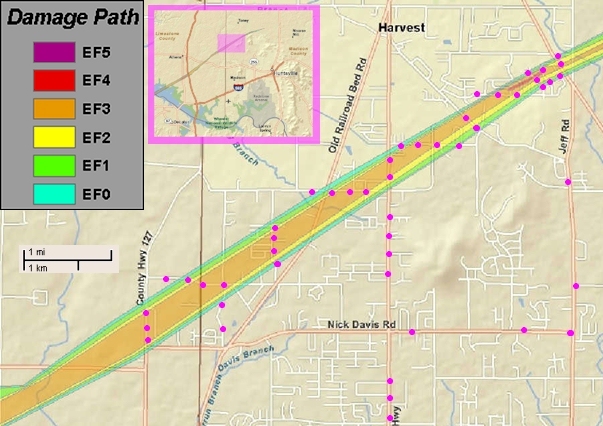 The photo path winds north and east – back and forth across the chaos; Love Branch Rd, Orville Smith Rd, Smith-Vasser Rd, Lockhart Rd, Yarbrough Rd, Wall-Triana Hwy, Stovall Rd, Ford Chapel Rd. . . Thunderbird Rd brings us into the south side of Anderson Hills; Maverick Dr, and Taurus Dr. From the crest of the hill you can barely see the remains of the top of the Piggly-Wiggly grocery store on Hwy 53, under the power lines. I was working at the NAMRC field clinic, setup in the cafeteria at Sparkman School, about a half mile south of there. (I’ve also updated http://w4hmc.wordpress.com this week) . . . Swept completely off the foundation . . . This one was apparently swept clean off the foundation – you can see the bricks on the left, the entire first floor reduced to nothing more than toothpicks, rubble and dust. I see not only the houses that have been smashed, but the people that can’t live there anymore, and don’t have anywhere to put what little they might have left. hiding from this tornado – while the roof & the walls are being sucked away….. Some of these folks had not much to start with, and what little they had may now be completely gone. And they are thankful to be alive, and wanting to help their neighbors first. They are all so grateful for our help. Please do !! They know first-hand the value of life. I’m sure I’ll get beyond all this someday, but I will never be the same. but I feel their pain and suffering …………… it is very real. It’s actually related to post-traumatic stress disorder (PTSD). that do the hardest part in these disasters – search and rescue, and the inevitable recovery of the friends and neighbors that lost their lives. I’m sure that in that line of work, they have training, and experience that helps them to prepare themselves for these hard parts, and hopefully the joy in helping save others helps balance out that pain. It can’t be easy . . .
God Bless Them All. . .
Tanner Tornado, 1 week later. Last Thursday the clinic operation had concluded, and MSFC was still not open. What to do… After a week of such intense activity, the clinic staff had become my new family – and that was my new job. NASA seemed so far away. 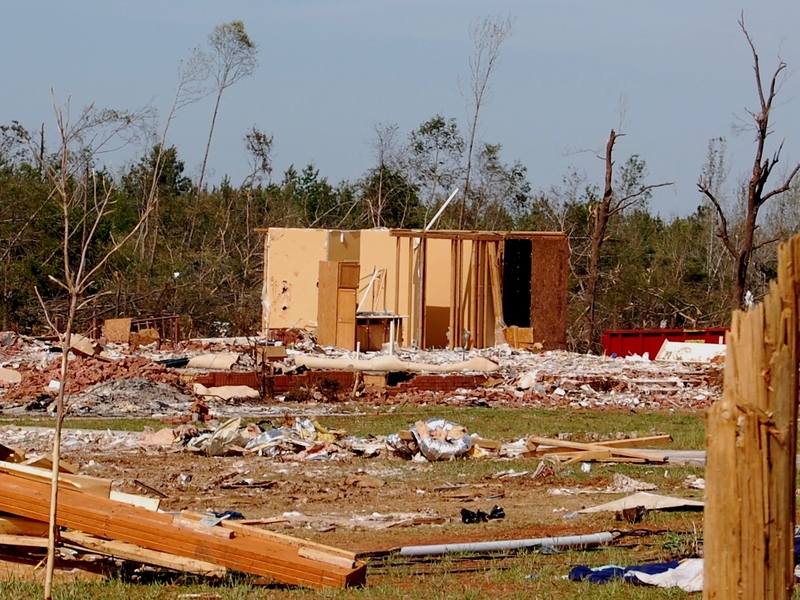 I had learned the night before that co-workers were helping a team member who had taken nearly a direct-hit from the storm in Tanner, Alabama – about 15 miles west of me. I went to help, taking everything that was still in the Subaru, and adding some more as I wasn’t sure what to expect. Understanding that this was a full week after the storm, I was still shocked at what I saw. I still have a hard time with some of these pictures, recognizing that there were at least three fatalities in this neighborhood. The pictures speak for themselves, I don’t want to get into a description of the horrific devastation I encountered. This is my first and hopefully only F5 tornado. It is so hard to believe this is real. I do want to post these pics tho, because most folks saw the news, and accepted that it was bad, and have already moved on. It is still bad, and will be for a long time. Greg’s house was not destroyed, but one end of the roof was torn open, and every room inside has suffered water damage. Nearly every tree on his two lots has already been cut up and prepped for burning. Large burn piles release huge plumes of thick black smoke. Several of the lots have already been completely bulldozed with only a few piles of rubble left. The main thing I could help with was to connect a second generator to his daughters house next door, and re-connect the generator into the two panels at his house – to make sure it would be safe for the next week or so. Seeing the destruction wrought by the 200+ mph winds, it is truly a miracle that anything was spared. The survivors there are surprisingly calm and obviously counting their blessings. They know it will be a long road to recovery. They know the value of their friends and neighbors – and are seriously grateful. Help your neighbors every chance you get. OK, I don’t plan on more pics of destruction, but I will surely have more links to stats and other information on this event as I encounter more detail.